There are 22 Assisted Living Facilities in the Cleveland area, with 17 in Cleveland and 5 nearby. 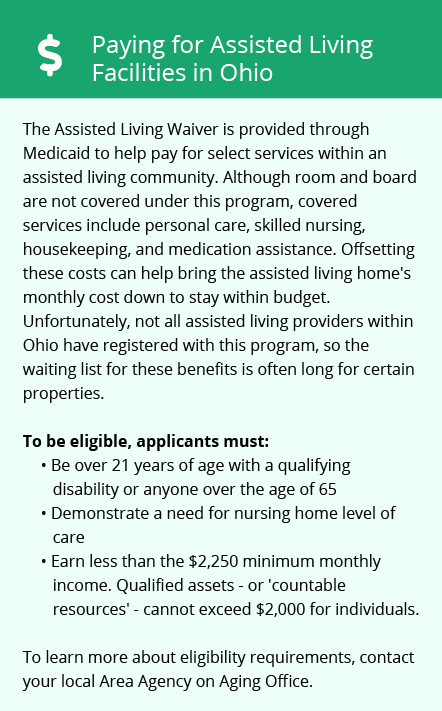 The average cost of assisted living in Cleveland is $4,069 per month. This is higher than the national median of $3,346. Cheaper nearby regions include Lakewood with an average starting cost of $3,200. To help you with your search, browse the 99 reviews below for assisted living facilities in Cleveland. On average, consumers rate assisted living in Cleveland 3.6 out of 5 stars. Better rated regions include Lakewood with an average rating of 4.2 out of 5 stars. Caring.com has helped thousands of families find high-quality senior care. To speak with one of our Family Advisors about assisted living options and costs in Cleveland, call (855) 863-8283. Cleveland, Ohio, has the second largest theatre district in the country and offers an array of exciting things for residents and seniors to do including visiting museums and zoos and going on greenhouse tours. The city is also home to 47,496 seniors, some of whom may benefit from assistance with daily activities. There are 18 assisted living facilities in Cleveland to accommodate these seniors. People in Cleveland and the rest of Ohio call assisted living facilities Residential Care Facilities (RCFs), which are licensed by the Ohio Department of Health. Cleveland is a member of the AARP Network of Age-Friendly Communities, meaning that its elected leadership "has made the commitment to actively work toward making their own town, city or county a great place for people of all aged," according to AARP. The Greater Cleveland Regional Transit Authority (RTA) operates the city's public transportation system, which includes a mixture of buses, trolleys and rail lines. Seniors can purchase discounted passes or fares by showing their ID and either a Medicare card or an RTA Senior ID. The Cleveland area is home to world-class medical facilities, including University Hospital and Cleveland Clinic - Fairview Hospital, in the event of medical emergencies or illness. Cleveland and Ohio don't tax seniors on social security income, which could help seniors who rely on benefits to have more money to allocate toward their care. Cleveland's cost of living is 77.1, more than 20 points lower than the national average of 100. Seniors living in the city can expect to save money on groceries and healthcare making the area more affordable for seniors with tight budgets. Cleveland has four distinct seasons, allowing seniors to enjoy bright-colored bloom in the spring, visits to the lake in the summer, beautiful fall foliage and snow-covered winter scenery. The area receives 40 inches of rain per year, only one inch more than the U.S. average of 39, and 66 inches of snow, 40 more inches than the national average of 26. Assisted Living costs in Cleveland start around $4,069 per month on average, while the nationwide average cost of assisted living is $4,000 per month, according to the latest figures from Genworth’s Cost of Care Survey. It’s important to note that assisted living rates in Cleveland and the surrounding suburbs can vary widely based on factors such as location, the level of care needed, apartment size and the types of amenities offered at each community. Some Cleveland area facilities accept payments from one or both of the state's financial assistance programs for seniors living in an assisted living community. 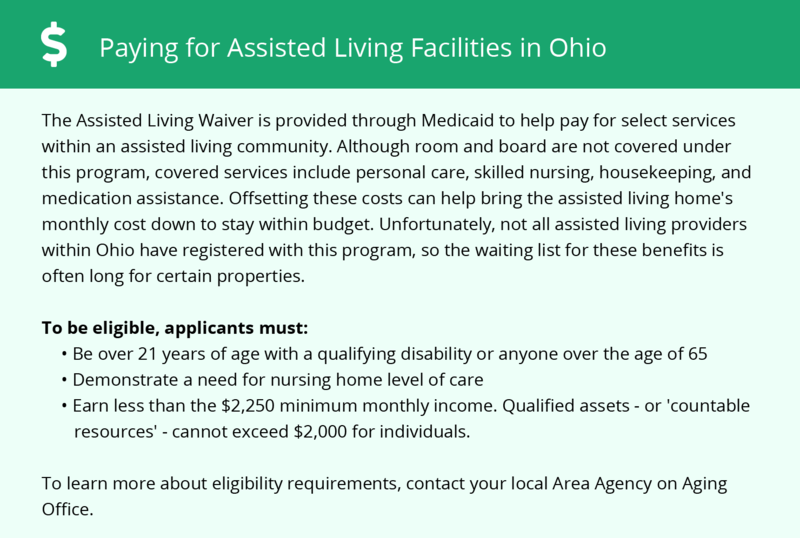 The Assisted Living Waiver is part of the state's Medicaid program. It helps cover the costs of personal care services for seniors residing in an assisted living facility. Also, seniors who qualify for SSI payments might also qualify for supplemental SSI payments from the state. You can apply for both of these programs through the Cuyahoga County Department of Job and Family Services. To see a list of free assisted living resources in Cleveland, please visit our Assisted Living in Ohio page. Cleveland-area assisted living communities must adhere to the comprehensive set of state laws and regulations that all assisted living communities in Ohio are required to follow. Visit our Assisted Living in Ohio page for more information about these laws.